A beautiful, very large president desk designed by Clausen & Maerus, manufactured by Eden in Norway around 1960. It is made of high quality teak wood in a warm brown color that gives it a luxurious appearance. The desk has three tambour doors in the top, that open and close smoothly and reveal plenty of storage space. In addition there are four drawers with elegant thin metal handles underneath the top. The piece has a beautiful finish. The black feet add to the overall luxurious style of the piece. This will definitely draw the attention in any office space! 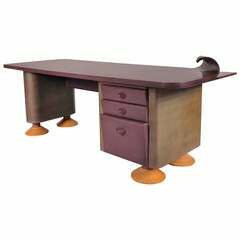 The desk remains in very good, restored condition, preserving a wonderful vintage patina. "President" desk by Parice Maffei for Kappa in steel. French work, circa 1970. Thick glass in perfect conditions.